Worcestershire sauce is a complex sauce typically used to provide an array of sweet, sour and salty flavors to cooked meats. There are many ingredients in Worcestershire sauce, such as Lea and Perrins Worcestershire Sauce. It is important to note that this sauce is not vegan as it contains a substantial amount of fish. If you are allergic to fish, you should avoid this sauce and seek an alternative. According to nutrition information provided by Lea and Perrins, vinegar is the primary ingredient of Lea and Perrins Worcestershire Sauce. 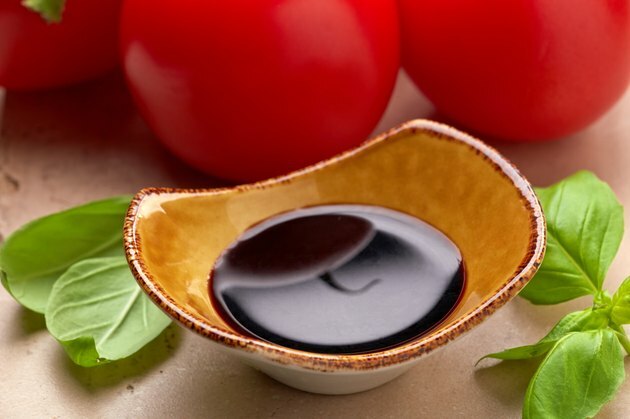 Vinegar contributes to the tangy flavor to the sauce. Vinegar also gives some acidity to Worcestershire sauce, which adds flavor to the sauce as well as the foods that it is used with. Molasses adds texture and thickness to Lea and Perrins Worcestershire Sauce. Molasses also contributes to the sweetness of the sauce. Most of the sweet flavor of Lea and Perrins Worcestershire Sauce comes from high-fructose corn syrup. While high-fructose corn syrup is one of the main ingredients of this sauce, it is not found in as high levels as it is in soda, soft drinks and some juices. Anchovies are added to Lea and Perrins Worcestershire Sauce to give it a characteristic flavor. The California BBQ Association explains that anchovies have long been used in meat sauces, particularly by English who have made anchovies a mainstay in sauces since the 18th century. Water is added to Lea and Perrins Worcestershire Sauce to give it more volume. Onions are one of the many flavorings added to Lea and Perrins Worcestershire Sauce to give it its distinctive taste. Lea and Perrins Worcestershire Sauce has a recognizable salty taste that comes from salt, which is added to the sauce. While Lea and Perrins Worcestershire Sauce resembles other sauces such as soy sauce and fish sauce, the salt and sodium content of Lea and Perrins Worcestershire Sauce at 65 mg per teaspoon is considerably less than other sauces. Garlic also contributes to the flavor of Lea and Perrins Worcestershire Sauce. Tamarind is a seed grown in Africa and India that has both sweet and sour flavors. Tamarind found its way into sauces such as Worcestershire Sauce through the English as they colonized India in the 18th century. According to the Missouri Botanical Garden tamarind adds to the distinctive flavor of Worcestershire sauce. Cloves are used as a spice to provide flavor to Worcestershire sauce. Lea and Perrins lists "Natural Flavorings" as an ingredient of their famous sauce. A November 2009 article in "The Mail" explains that this in part to preserve the secrets behind the sauce's recipe. The article goes on to explain that the original recipe of the sauce dates back over 170 years and hints that ingredients such as soy sauce, lemons, pickles and peppers may be part of the "Natural Flavorings" in this sauce. Chili pepper extract is a spice added to Worcestershire sauce for both flavor and mild spiciness.